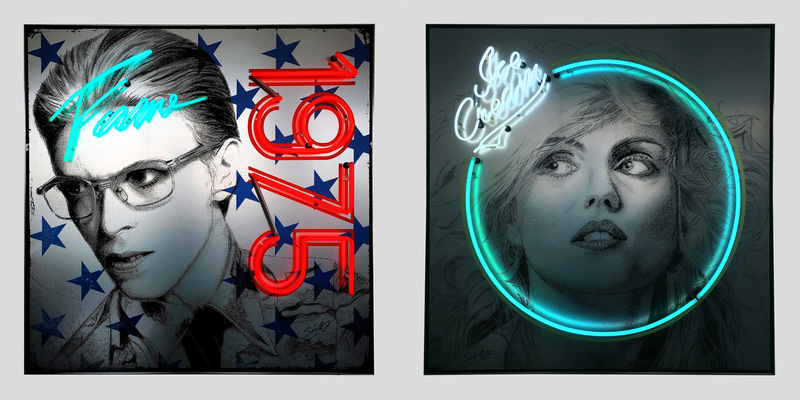 Louis Sidoli creates iconic portraits with neon elements all encapsulated within a wood and aluminium bespoke frame to make stunning works of art. 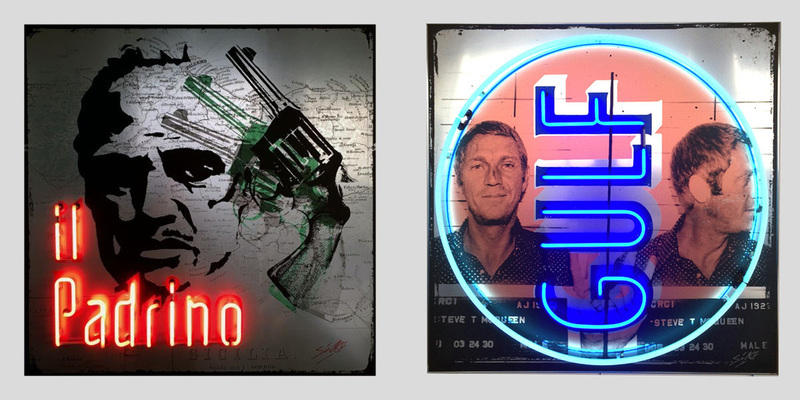 Most recently his work features the addition of neon bulbs blending with the imagery to create high octane pieces that evoke the electric characters of the celebrities he depicts. Louis grew up on what he calls the ‘mean streets’ of Royal Leamington Spa, apart from a brief stint in London he has always been based in Warwickshire. His childhood was a happy one, growing up in an Anglo-Italian family in the 1970s/80s in what he calls an incredible period and a “high point of popular culture in western society. 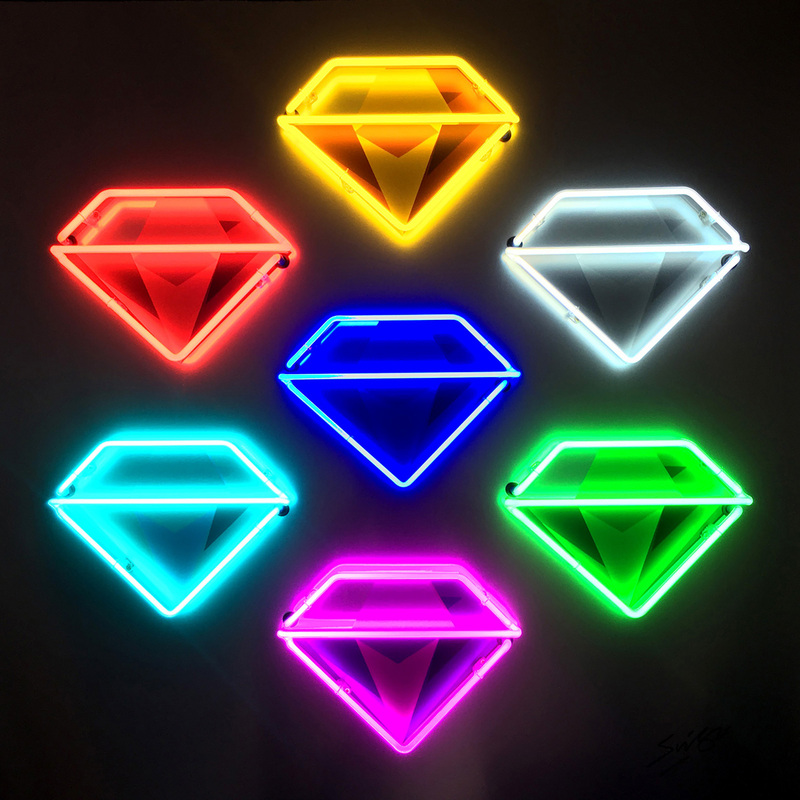 I soaked it all up from an early age and this has influenced my career as a pop artist.” Louis’s career has been shaped by various influences, he started out working in design for the car industry, including some brand consultancy for the board of Rolls Royce and Bentley cars. In this time he was able to interview their clients in focus groups for ‘in depth’ personal interviews. 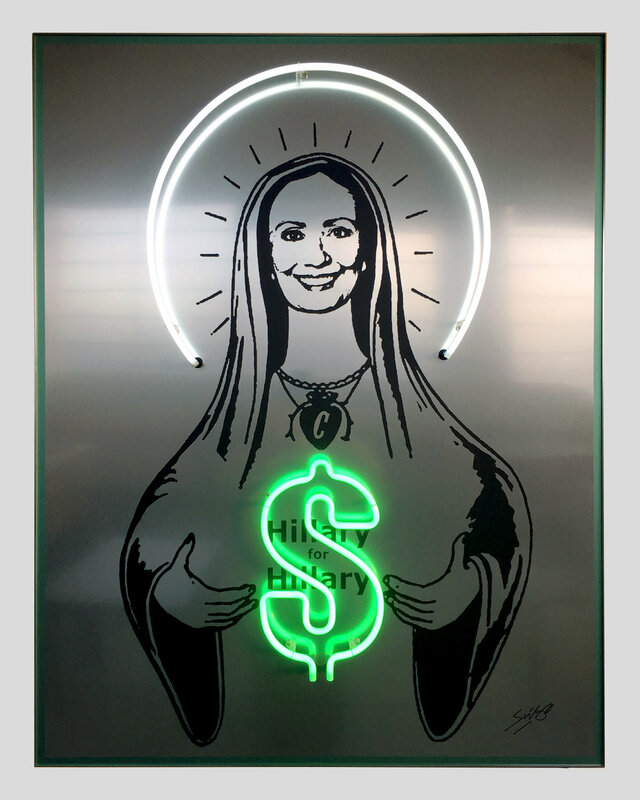 Louis works with iconographic imagery with beautifully placed neon features on top of brushed aluminium. The works are put together with precision; he claims to be a perfectionist with a love of things of high quality, as he says “I would rather have just a few things that are top notch quality than loads of cheap crap!” As for creative rituals Louis states that he “can only be creative if I have cleared my desk of paperwork and ‘admin’. Personally I find it hard to get into the creative zone when you have a million and one other tasks piling up that need attention. 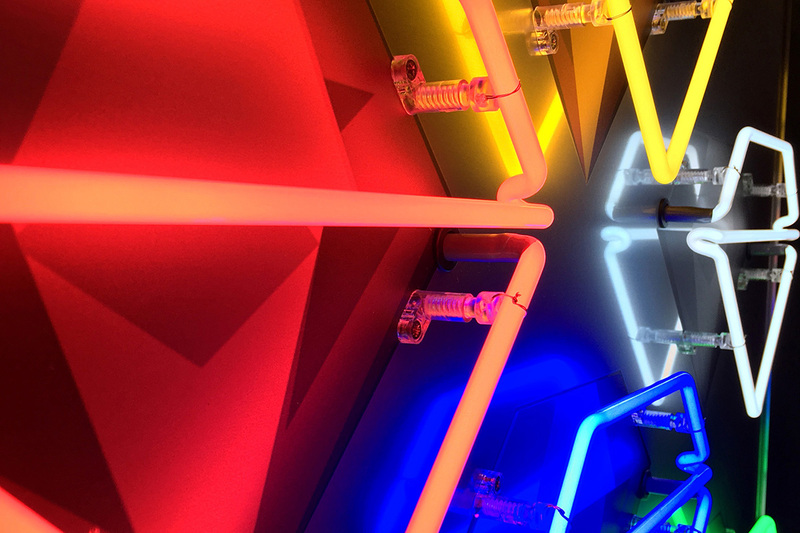 I do a lot of research into my subject matter, that normally triggers ideas for the artwork.” As for inspiration, he cites those who are “unusual and think differently”. Fittingly, one of his most beloved subject matters at the moment is David Bowie, the original kook and crusader for all things weird and wonderful. 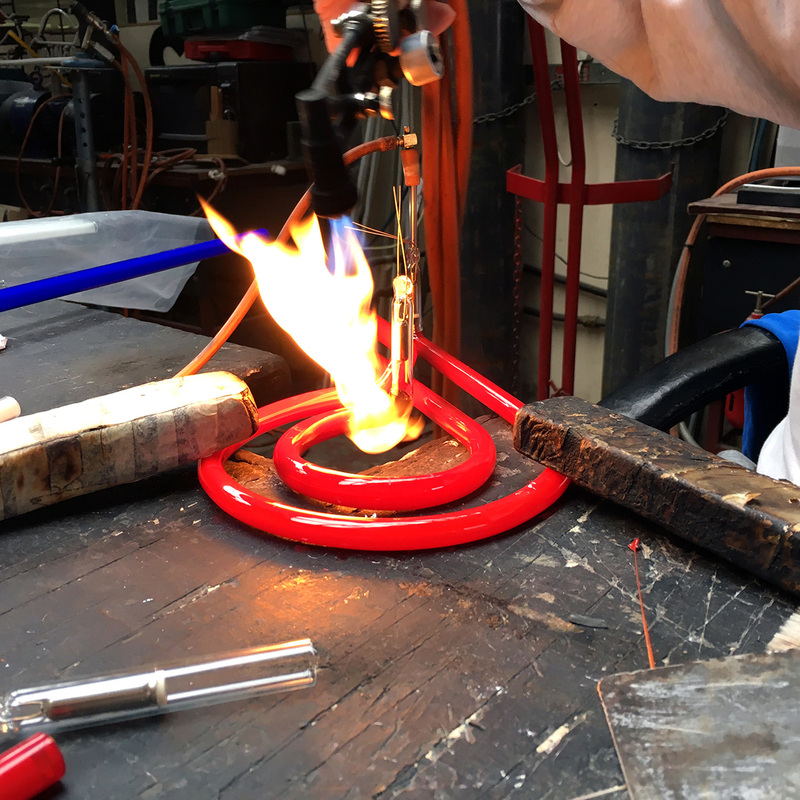 Louis currently works in a studio at the Jubilee Centre, most of his suppliers are based locally so logistically it makes sense rather than hiking out huge rents and supplier costs in London or elsewhere; Louis is bringing back art manufacturing to the city and it’s refreshing to see such talent residing here. For him the “workspaces are a God send for creatives and small businesses like me.” When I asked him what he loved most about the second city his answer was “Spaghetti Junction” – it must be those Italian roots!